Can the Fiat 500 catch fire in America, where other small, cute cars have burned out? Chrysler thinks so, but lively new entries such as the Ford Fiesta stand in the way. Ready or not, the Fiat 500 is coming to dealerships early next year armed with Italian style and penny-pinching fuel economy. The 500 was the cute little economy car that put postwar Italy on wheels when it arrived in 1957. The 500 holds a special place in the hearts of Italians, much as the Volkswagen Beetle does for baby boomer Americans. Now Fiat is pinning its hopes for a revival in North America on the new 500, considerably bigger than its pipsqueak predecessor but much smaller than any vehicle Chrysler has sold. Can the car -- tiny by U.S. standards -- justify Chrysler's substantial sales forecasts? It's a wide-open question that dealers are asking themselves as they await Chrysler's selection of about 165 Fiat dealers. Fiat wants Americans to forget the "Fix It Again, Tony" stigma of yore and think of the 500 as herald of a new era for Chrysler and its Italian partner. But the closest most Americans have been to a 500 was the 2006 Pixar cartoon film Cars, which featured an animated look-alike named Luigi. So Fiat marketers will have to overcome the car's lack of history here. Mini succeeded, but only with bundles of BMW marketing and engineering muscle. The 500 will land in a U.S. market that has historically looked askance at small cars, but the segment is changing rapidly. The 500 will have to jockey for space not only with Euro-cute rivals such as the Mini but also with aspiring newcomers such as the Ford Fiesta, which offers upscale features and achieves nearly 40 mpg. At an Aug. 30 meeting with dealers in Detroit, Fiat said it expected the 500 to peak at about 78,000 units in 2013 for North America. Some dealers and analysts believe that number is overly optimistic. Rebecca Lindland, analyst for IHS Automotive in Lexington, Mass., says her firm is projecting Fiat 500 sales peaking at 40,000 in 2012, then dropping off to about 35,000 after that. She says there is a "fad factor" with a fashion-statement car like the 500. BMW has been successful with the Mini because the automaker has stoked interest with a steady cadence of new models and new body styles, such as the Clubman, Lindland says. "There has been a lot of love given to that vehicle to keep it strong." But even the Mini has fallen short of the numbers that Chrysler is aiming at for the 500. Launched by BMW in North America in 2002, Mini sold 24,590 units in the United States that year. The brand peaked at 54,077 in 2008. Meanwhile, Daimler AG's Smart came after Mini and has been less successful. Smart peaked in 2008 at 24,622 and fell to 14,592 in 2009. The 500 "is somewhere between the Mini and the Smart" in terms of size, Lindland says. "You look at the Smart car and those volumes, and you've got to be afraid." The 500 is 139.6 inches long, 6 inches short of the basic Mini. 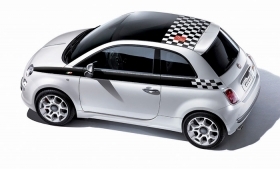 Fiat has not released prices of the 500, but stickers are expected to start around $15,000. Like the Mini, the 500 will be no one-trick pony. Fiat plans a convertible and a sporty Abarth version in 2011 and an electric version in 2012. A four-door, high-roof version will arrive in 2013. But the 500 will face stiff -- and growing -- competition. On one hand are boutique-style competitors such as the Mini and the Smart. On the other are mass-market choices such as the Fiesta and the subcompact segment leaders, the Nissan Versa and the Honda Fit. The Europe-bred Fiesta comes with a long list of standard features to make customers forget the day when small cars were Spartan conveyances. Those features include a voice-activated sound system, automatic dimming mirrors and seven airbags. "Every manufacturer has plans to offer very attractive small vehicles," says Mike Jackson, chairman of AutoNation Inc., the nation's largest dealership group, which is applying for some Fiat franchises. "If you're going to sell a small car successfully, it has to put a smile on your face. The 500 does that." 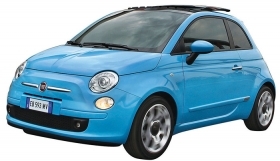 Chrysler declined to discuss prospects for the Fiat 500. "We are confident that the Fiat brand will achieve all the business targets set for the brand's reintroduction into the North American market," said Chrysler spokesman Ariel Gavilan in a statement. Jesse Toprak, analyst for TrueCar.com, believes the 500's Italian design will help those Chrysler dealers who win the franchise to lure new customers. "The halo effect of this car and the utility of this car will grab younger clientele and early adopters," he says. "Those are the two segments Chrysler had difficulty attracting, especially in the metropolitan coastal areas. This car will do really well in Southern California, New York, southern Florida." The Fiat 500 will have to jockey for space not only with Euro-cute rivals such as the Mini but also with aspiring newcomers such as the Ford Fiesta, which offers upscale features and achieves nearly 40 mpg. But Lindland says Chrysler's reputation is built almost entirely on big, powerful "American-rooted vehicles" such as the Hemi-powered Chrysler 300, Ram full-sized trucks and Dodge Challenger. "To try and get the consumer to accept Italian-engineered cars is going to be a challenge. It's not that they can't do it. But it won't be easy." The 500 will be sold by a select group of about 165 Chrysler dealers, many of whom have not had anything nearly as small as the 500 in their showrooms. Chrysler believes the 500 will draw a broad array of customers: "men, women, Gen-Xers, Millennials and Baby Boomers," according to a document distributed to dealers who applied for the franchise. "The Fiat brand is also a great source of national pride and heritage for Italian-Americans." Mike Maroone, president of AutoNation, says the 500 will appeal to young buyers who want something more than basic transportation and who like to personalize their vehicles. Brands such as Mini and Scion have successfully catered to those buyers, he says. Personalization is an area in which "Fiat has a lot of good ideas," Maroone says. Like Mini, Fiat will offer special graphics, carriers, custom wheels, spoilers, seat covers and so on. AutoNation's Mike Jackson: "If you're going to sell a small car successfully, it has to put a smile on your face." Cuteness and personalization aside, the 500's success hinges on gasoline prices. The 500's EPA gasoline mileage numbers have not been published yet. It will be the first North American vehicle to showcase Chrysler's MultiAir engine technology. Fiat says MultiAir improves fuel economy by 10 percent. That means the North American version should easily surpass 40 mpg compared with current European versions without MultiAir. Sources have told Automotive News that Fiat 500 test drivers have achieved even better than that -- 50-plus mpg on Chrysler's test track in Chelsea, Mich. If the production 500 hits anything close to 50 mpg, it could be a game-changer. 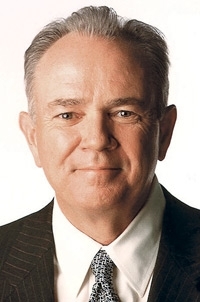 AutoNation's Jackson says: "If gas is $6 a gallon, we'll be selling a gazillion small cars."